We all want breakthrough for our dogs. But how do we successfully meet and greet strangers on the bike path, sidewalk, & pet store while maintaining great dog behavior? People may tell you it’s perfectly okay for your dog to jump on them upon greeting… but really, is it okay? Absolutely not. Because when we okay jumping/ lunging/ barking/ pulling toward a 150 pound adult, we also okay it toward a toddler and our grandparents. We okay it on rainy days, on Thanksgiving and on days we are dressed with our best clothes… We okay it all of the time. This is unfair to our dogs because they don’t know our nice pants from our lounge pants. It’s time for us as dog handlers to start saying what we really think, and not let society pressure us into something else. 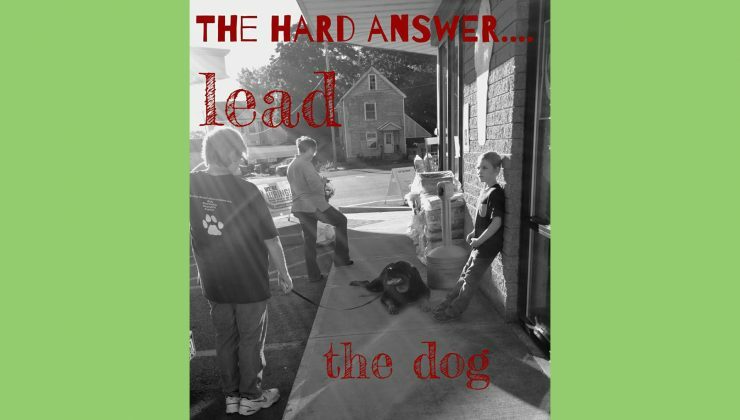 Become the leader your dog wants you to be… Follow me so far? Our dogs are often frustrated, over whelmed, over stimulated and a bit bossy, with high anxiety and low self-confidence. We get the right books to train them, we use positive reinforcement and we use negative reinforcement. We buy more tools, we ask the neighbor what they are doing, and then finally we tuck the dog away in a crate and nervously laugh and hold our breath when we encounter other dogs or strangers. So, let’s get down and dirty now. How do we stop the nonsense and cultivate the inner beauty of our dogs? How do we turn a nervous, stressed, anxious, low self-confidence dog around? Advocate your dog’s space. We all have a personal space zone. If you have ever taken a dog training class with me, you know about dog and people personal space. People usually have about a 2 foot personal zone before we are the “close talker” from Seinfeld. Dogs usually have a range of 2 feet to 10 feet. But, the higher the anxiety for the dog, the wider the range for their personal space zone. Ever witness a dog (or own a dog) that continuously barks, growls, and whines at other dogs and people from two blocks away? High stress = Expanded personal space! Teaching a nervous, stressed, anxious dog that they DON’T HAVE TO PROTECT YOU, that you are there to advocate for them, and protect them, will allow the dog to drop their anxiety level. If the dog truly wanted to be a leader to you, to be your advocate and your protector- they would already be doing a great job. Imagine (and no political statement being made here) if our country’s president were to not protect us, were to not advocate for us, and let us pave the way for stressful situations against circumstances we perceived as threatening- we would be making erratic choices, be overly stressed, and highly anxious! So many people hire me as a dog trainer with a family pet dog who is on the threshold of a nervous breakdown, but also saying they insist on that dog protecting them while walking on a rail trail. How about giving a dog a job they can succeed at first, so they are not living in a constant state of panic! These dogs are panicking because they are constantly stressed with the work load put on their shoulders. What do I do? Carry pepper spray to do my heavy lifting on the rail trails. I will not make the psychological jump in thinking that my beautifully spirited family pet dog can or should take the brunt of any personal or physical harm that may come to me in a break in, or a mugging on the trail. I will not let my dog be my protector on the trail if we encounter an aggressive dog and take a bite for me. Ask yourself – did your family dog fill out a job application for that position when you asked them to move in with you? Did you provide the necessary training to that dog so he could consistently make good choices, and did you teach him that the mail man is okay, whereas someone creeping around in the front hedge is not? Don’t hear me wrong- they are allowed to bark, give a growl. But once you are on deck- their job as a warning system is DONE! Having a professionally trained protection dog… it’s a real thing in our community. A close friend and trainer here at Run By Dogs does protection training with her Shepherd. It’s different from the more acknowledged schutzhund training. A well trained protection dog should be confident and fearless and ONLY charge/bite on command. They should also release their target upon command without a second thought. But it also takes hundreds of hours to teach this to a dog. And only to a dog who truly wants to do this work. This blog just touches the iceberg of what advocating for a dog’s space means. For real training, come into the center for some state of mind work with your dog. When we change the way we advocate for our dogs, we also change much of the conversation of how dogs interact with people/dogs. It is part of the answer to great dogs (the other parts are good obedience training and follow through). They stop barking, stop jumping, stop lunging, and they start being mindful. So many dogs are struggling with high anxiety and nervousness; let’s start changing that picture back to calmness and confidence.